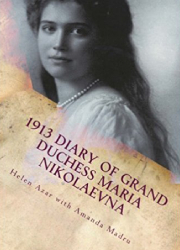 While the Grand Duchesses have left no extant diaries from after the revolution, their letters to their friends are full of fascinating detail about their every-day lives and the circumstances they found themselves in. Their younger brother Alexei likewise has in his letters provided a wealth of information about the last few months of this devoted family. 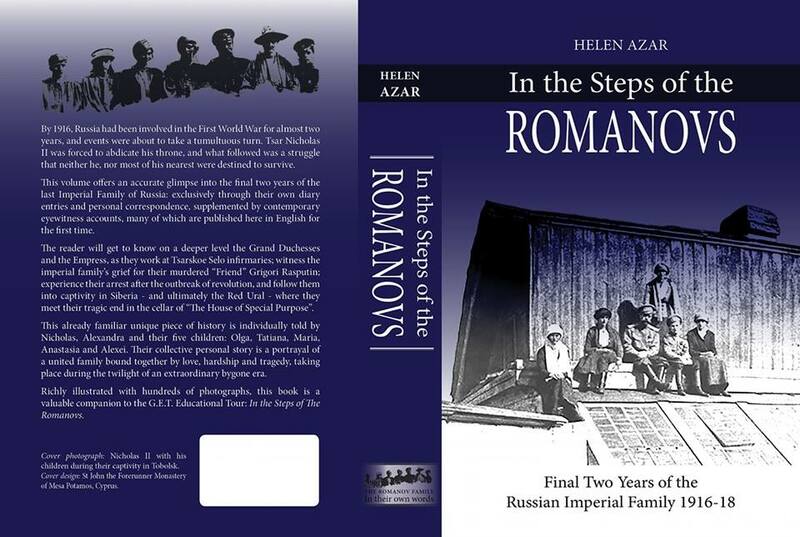 In translating the personal writings of the Imperial Family, author Helen Azar has preserved the particular idiosyncrasies and writing style of them. While at times this may make for some unusual turns of expression or use of language, it actually gives the reader a feeling for the true ‘voices’ of the Imperial Family and how they thought. The book opens in 1916 where we see how the Imperial Family were dedicated to the war effort. 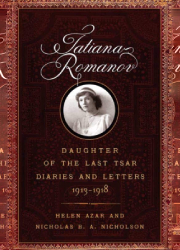 The Tsar’s daughters were devoted to their patients at the hospitals and their diaries and letters are full of their interactions with them. 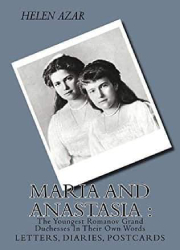 While Grand Duchesses Maria and Anastasia were not nurses like their older sisters, they too spent much time visiting the wounded. All four wrote detailed letters to their father and brother when they were away at General Headquarters. 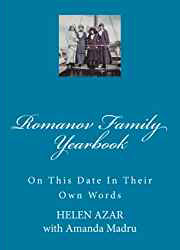 Included in this section are large amounts of 12-year-old Tsesarevich Alexei’s diaries. 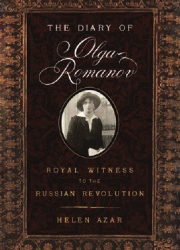 Of particular interest is the large amount of material, newly translated into English, from Nicholas II’s 1917 diary, detailing the Romanov’s day-to-day lives in a time of tumultuous change. Initially, in the first two months of 1917, everything is as usual. Then comes the abdication and the adjustment to a new way of life as prisoners in the Alexander Palace at Tsarskoe Selo. The ex-Emperor writes in detail about how he and the family pass their days. In August the family is transferred by train and steamer to the provincial town of Tobolsk in Siberia. 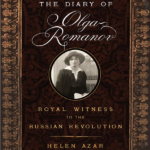 The Tsar’s diary outlines the events of this journey and how they spent their time on the river steamer after it was found that the Governor’s House in Tobolsk was not yet ready for them. At the Governor’s House, the family had to adjust to living in much more confined circumstances than before, while still having some freedoms. Diary entries and letters detail their daily lives in Tobolsk. During this time, despite all correspondence being checked, the Imperial Family wrote long, detailed and informative letters about how they passed their days. Occasionally signs of frustration show through but in general the family remained cheerful and optimistic. 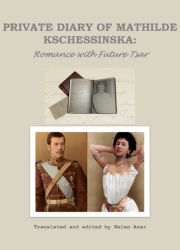 In April 1918, Nicholas, Alexandra and Maria are transferred to Ekaterinburg while the three other Grand Duchesses and Alexei remain in Tobolsk as the Tsesarevich convalesces from a bout of haemophilia. There is a flurry of letters between the parties, coded instructions and details of the journey to Ekaterinburg and how both sides were coping with separation from each other. The huge worry the Grand Duchesses have for their parents and sister is evident in their letters. 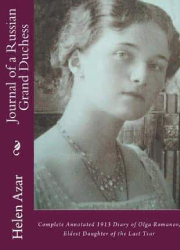 Following the transfer of Olga, Tatiana, Anastasia and Alexei to Ekaterinburg the Tsar and Tsaritsa’s diaries provide the reader with a glimpse into life at the ‘House of Special Purpose’, interspersed with their guards’ observations and impressions of the Imperial Family. 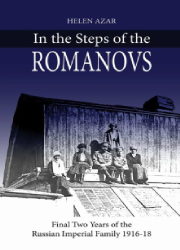 The book concludes with a translation of a letter Dr Botkin was writing on 16 July 1918 and the recollections of the night of 16-17 July 1918 by the Romanov’s chief executioner, Yakov Yurovsky. The discovery of imperial remains led to a revival of interest in the family, as many of their personal documents—all carefully preserved—came to light. 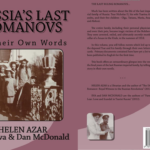 Today, after more than a quarter of a century, it seemed unlikely that anything new could be said about the last months and days of the Romanovs. 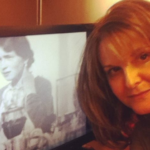 But as it turned out – even to my own surprise – there was. 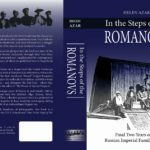 I started working on this manuscript with the intention of creating a simple, relatively short companion book for the 2018 centennial tour to Russia, called “In the Steps of the Romanovs”, organized by myself and managed by GET Educational Tours. 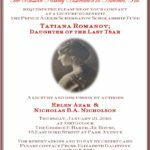 I decided to strictly use primary documents and photographs to recount the final two years of Russia’s last imperial family in the places the tour would be covering. 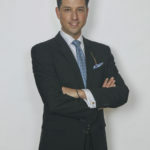 However, as I did my research and translations, the manuscript seemed to take on a mind of its own, and kept growing. I was discovering more and more primary documents that I did not even realise existed, which I felt had to be included in this book. So, before you is an almost 700 page volume, which of course is no longer a mere tour companion but a fully fledged book, which not only tells the familiar story in a unique way, but also provides a significant amount of new details. 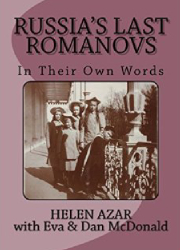 I feel that this final result is one of the most accurate accounts of the last months of the Romanov imperial family, since it consists strictly of first hand accounts, with very minimal subjective commentary from the author. I hope you feel the same way and enjoy reading it as much as I enjoyed creating it.